Need a home inspection in Farmington? Farmington, Connecticut is a town located in Hartford County, CT, which is located about 10 miles west of Hartford. It’s sometimes considered a suburb of Hartford, but with a population of around 25,000 as of the last available census data, it’s a fairly large town in its own right. It was originally inhabited in the 1640s, and is one of the oldest towns in New England, with a great number of historic destinations, homes, and areas, including the Hill-Stead Museum, Farmington Historic District, and Pequabuck Bridge. The town is very economically strong. Uniquely for a suburb, more people work in the town than live there, which is quite uncommon. The median income for a family in Hartford is $159,834, which is very high. A few of the largest companies and employers in the area include Fortune 500 Company United Technologies, as well as the Otis Elevator company, The American Red Cross, and Moore Medical. The University of Connecticut Health Center also employs about 5,000 people. Transit in the area is primarily road-based in nature. Busing is provided by CTtransit, which serves a number of other communities including Bristol, New Britain, and Wallingford, to name a few. Major roadways in the area include I-84, providing easy access to Hartford, as well as US Highway 6, and State Routes 10, 4, and 177. Schooling in Farmington is provided by Farmington Public Schools, which rank among the best in the nation. Miss Porter’s School, a world-recognized preparatory school for women, is also located in Farmington. Farmington, Connecticut is a great place to live. 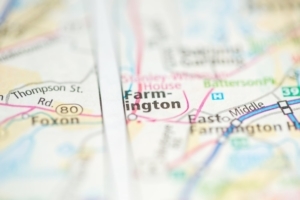 But if you need a bit more information about the city, and would like to learn more about what you can expect when you move to Farmington, we’re here to help. Below are a few helpful links and local resources which can help you get even more information about the area! Want to come to Farmington, or anywhere else in the Hartford area? If you’re shopping for real estate, you’ll need an experienced home inspector on your side. At Renovee Inspections, our team specializes in working with both in-state and out-of-state residents. You can trust us to take care of all of your home inspection needs in Farmington, Connecticut. Interested in learning more? Contact us to get more information about our services and availability. Ready to get started? Schedule your appointment online today!